Medical gases such as oxygen, carbon dioxide, nitrogen, nitrogen dioxide, nitrous oxide, and medical air etc. are integral part of hospitals and many other healthcare facilities and related industries. These gases are have varied application in hospitals for diagnostics to therapeutic purposes, in pharma and food industries for modified atmospheric packaging and in research and diagnostics centers to maintain and monitor controlled environment within facilities. The analysis of these medical gases in these facilities is important and crucial factor for patient and staff’s safety, for maintaining quality standards in pharma and food industries, and to get desired outcome in research laboratories. Medical gas analyzer are used for detection, measurement and analysis of these gases in hospitals and related industries. Based on characteristics and properties of medical gases, single and multiple gas analyzer with different gas sensing technology are available. The medical gas analyzer are used by hospitals, ambulatory surgery centers, diagnostics centers, research institutes, pharmaceutical and food packaging industries in their routine operations. The medical gas analyzer market is mainly influenced by the safety standards, regulatory compliance and the cost of equipment. Transparency Market Research estimates that the global medical gas analyzer market was valued at US$136.91 mn in 2015 and will expand at a CAGR of 3.1% from 2016 to 2024 to reach US$179.24 mn by 2024. On the basis of end-user, the global medical gas analyzer market has been segmented in the report into hospitals, ambulatory surgery centers, pharma, and food industries and other segments such as diagnostics centers, research institutes, and laboratories. Of these, medical gas analyzer are most frequently required and used in hospitals. As a result, the hospitals end-use segments accounted for the dominant share in the global market in 2015. This segment is anticipated to exhibit a CAGR of 3.1% during forecast period from 2016 to 2024 and retain its dominance. The healthy growth of the hospitals segment is expected to be driven due to the vast increase in number of hospitals, especially across developing countries. The demand for medical gas analyzers the pharma and food industries is expected to expand at the most promising rate over the forecast period. Demand will be driven by the increased adherence to the practice of modified atmospheric packaging in these industries and the increased number of pharmaceutical and food industries in emerging economies such as India, and China. In terms of geography, the global medical gas analyzer market has been segmented into North America, Europe, Asia Pacific, Latin America, and Middle East and Africa. Of these, the market in North America dominated the global medical gas analyzer market in 2015 and is projected to expand at a CAGR of 2.8% over the forecast period. High expenditure in healthcare infrastructure, implementation of standard safety policies in most healthcare facilities and pharma industry are the factors projected to drive the demand for medical gas analyzers in North America. The market in Asia Pacific is anticipated to exhibit the most promising growth rate at a CAGR of 3.6% over the report’s forecast period. The growth of this market is attributed to the rising numbers of hospitals and ambulatory surgery centers and heavy investments by foreign companies in healthcare and the pharmaceutical industry in emerging economies. Medical gas analyzer are devices used for detection, measurement and qualitative & quantitative analysis of single or mixture of medical gases. Five types of medical gases such as oxygen, carbon dioxide, nitrogen, nitrous oxide and medical air are widely used in hospitals and related healthcare industries. Single gas analyzer and multiple gas analyzer are two common types of medical gas analyzer used for analysis of medical gases. These medical gas analyzer detects, measures and analyze the concentration of medical gases and their mixtures at different levels using variety of gas sensing technologies such as electrochemical, infrared, optical, etc. Analysis and monitoring of medical gases in hospitals has become the integral and crucial part in patient diagnosis, monitoring and therapeutics. The use of medical gas analyzer in hospitals, and pharma and food industries is increasing across the globe for the safety of patients, medical professionals and operators in various healthcare facilities. Increasing number of hospitals and healthcare reforms for safety standards in developing countries across the globe are the factors expected to drive the growth for global medical gas analyzer market. New technologies have been developed for gas measurement such as electrochemical, paramagnetic, and infrared sensor technology. These technologies enable safer and quicker measurement of medical gases. Companies are spending more on R&D activities in order to develop products to measure trace levels of gases in the health care industry. Companies by using different technologies in one single device to measure multiple gases can target specific areas where accuracy is important. Paramagnetic and zirconia technologies for gas sensing are able to deliver these results. Majority of players in the gas analyzer market operate globally through strong distribution networks. Key players are expanding their business in developing and less developed countries through subsidiary companies and local distributors. The incorporation of multiple gas sensing technologies in single device to facilitate the analysis of multiple gases at a time lead to increased cost of these device which restricts the growth of medical gas analyzer market. Also lack of standardization to meet specific and precise needs in healthcare facilities in developing and under developed markets are the key restraints of global medical gas analyzer market. Based on type of analyzer, global medical gas analyzer market is segmented into single gas analyzer and multiple gas analyzer. 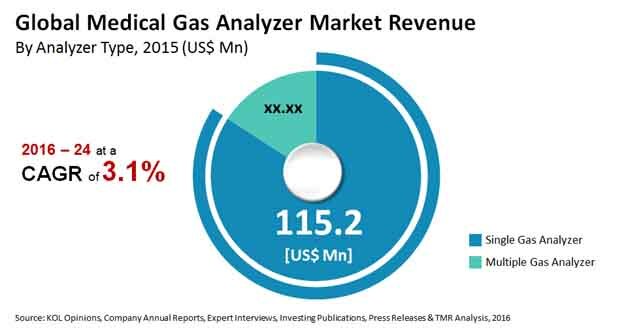 Single gas analyzer accounts for largest share of global medical gas analyzer market. On the basis of gas sensing technology single gas analyzer are further classified into electrochemical, optical and infrared gas sensing technology. Owing to specific application of electrochemical gas sensing technology towards analysis of oxygen and nitrogen gas and its economic cost, electrochemical gas sensing technology dominated the global medical gas analyzer market. This segment is projected to gain its market share with highest growth rate during given forecast period. By end-user, medical gas analyzer market is segmented into hospitals, ambulatory surgery centers, pharma and food industry and others. Medical gases have wide applications in hospitals which represents the high potential for medical gas analyzer. Hospital segment dominated the global medical gas analyzer market whereas pharma and food industries are projected to grow at exponential growth rate during forecast period. Both hospitals and pharma & food Industries represents the most attractive market for given forecast period owing to increasing expenditure on healthcare infrastructure and increasing number of hospitals and pharma and food industries, especially in developing countries. Geographically, the global medical gas analyzer market has been segmented into five regions: North America, Europe, Latin America, Asia Pacific, and Middle East and Africa. These regions have been further segmented by countries, analyzer type and End-user segments. The competition matrix section included in the report is likely to assist the existing players to increase their market shares and new companies to establish their presence in the global medical gas analyzer market. The report also profiles major players in the market based on various attributes such as company overview, financial overview, SWOT analysis, key business strategies, product portfolio, and recent developments. Major companies competing in the medical gas analyzer market, and profiled in the report include Fluke Inc., Teledyne Technologies Incorporated, Servomex Group Limited, Geotechnical Instruments (UK) Ltd., TSI Incorporated, Maxtec LLC, WITT-GASETECHNIK GmbH & Co KG, Drägerwerk AG & Co. KGaA, Sable Systems International, Systech Instruments Ltd. & Illinois Instruments, Inc., Critical Environment Technologies Canada Inc., and VISCIANO s.a.s.